Velvet in a bowl, vichyssoise! This traditional soup is made with only a few ingredients, potatoes, leek, heavy cream and broth besides the spices which were garlic, bay leaf, salt, pepper and nutmeg in my case. There is an ongoing dispute if the recipe is a French or an American invention. 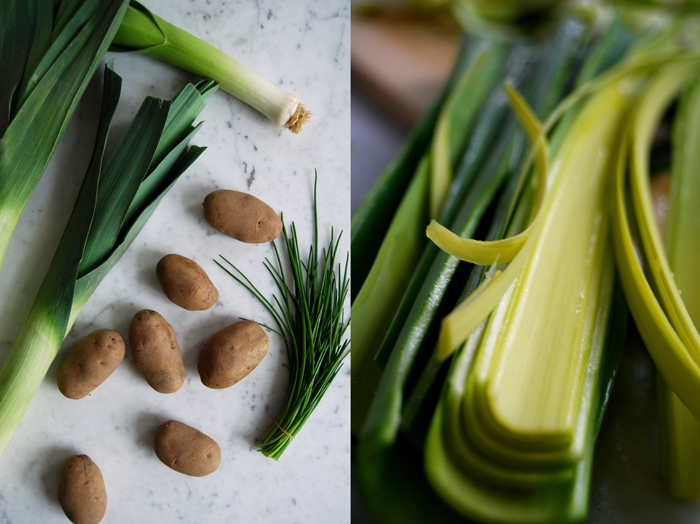 Louis Diat from a French town close to Vichy who was a chef at the Ritz Carlton in New York claimed that he cooked the first vichyssoise in the early 20th century, in remembrance of his mother’s and grandmother’s cold potato and leek soup. The first written proof is found in 1923 in French culinary magazines which relate it to the American cooking. Either way, it’s such a simple yet delicious soup and one of the first recipes I made on my own when I started cooking. I always preferred to eat this soup warm and not cold as I’m not too fond of cold soups in general. 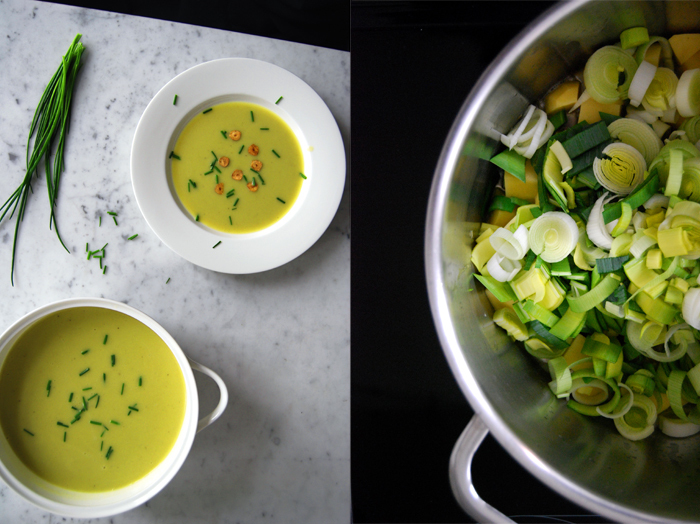 My vichyssoise is quite leeky and light, I go easy on the cream and want the vegetable’s flavours to be prominent. My addition of garlic and bay leaf is also a variation on the original recipe. That’s what recipes are for, to evolve and adapt them to your own taste! In a large pot, heat the butter and a splash of olive oil and sweat the potatoes and leek for a few minutes. Add the broth and spices and simmer for 25 minutes on low heat. Take out the bay leaf and purée the soup in a blender or with a stick mixer. Whisk in the cream and bring to a boil, cook for about 5 minutes and season with salt, pepper and nutmeg to taste. In a sauce pan, heat a splash of olive oil and fry the slices of garlic for a few seconds until golden and crisp on both sides. Don’t burn them as they will taste bitter. 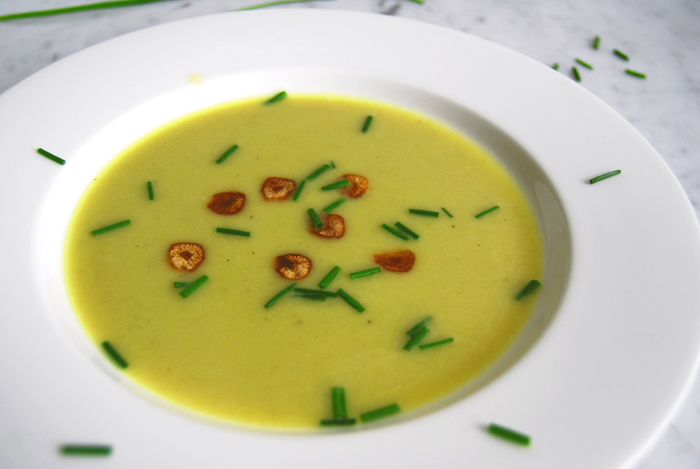 Either serve the soup immediately, sprinkled with the garlic chips and chives, or let it cool and chill in the fridge. All of my favourite flavours! I love the idea of those crunchy garlic chips too.